Five months after two nonprofits sued Liberty Bank in Connecticut federal court, the Middletown mutual lender has settled, according to hartfordbusiness.com. Liberty Bank pledged $15 million in loans and grants as a way to increase its mortgage lending as well as opening a loan office in Hartford to settle the unfair lending claims, hartfordbusiness.com reported. The lawsuit was filed in October 2018 by the Connecticut Fair Housing Center and National Consumer Law Center who accused Liberty Bank of violating federal laws by allegedly denying at higher rates or not providing adequate mortgage lending services to individuals living in Latino or African-American neighborhoods, the article said. The lawsuit stated that the bank had violated the Fair Housing Act by engaging in unlawful redlining of predominantly Latino and African-American neighborhoods in greater Hartford and New Haven metroareas. Redlining is a discriminatory practice used by banks or other financial institutions to deny or avoid providing credit services to consumers because of the racial or ethnic demographics of their neighborhoods. 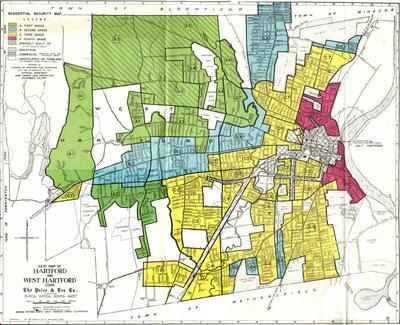 1937 map of Hartford illustrating redlining. Green areas indicated the best places for mortgage investment — red indicated the highest risk. The lawsuit accused Liberty Bank of structuring its residential mortgage lending business to avoid serving the credit needs of individuals in areas with predominant Latino or African-American populations. Liberty Bank denied all allegations of wrongdoing, but said $10 million will be added to expand its Good Neighbor Mortgage Loan Program. In addition, it set aside $300,000 for subsidies to promote home ownership and enhance access to credit in communities with a history of constrained credit. It also will open a loan-production office in Hartford. Liberty Bank will expand it community development program by $5 million over the next three years as a way to further support community service, economic development and diverse affordable housing projects in underserved low- and moderate-income areas. To achieve this, it will make an additional $200,000 available in grants for qualified organizations from these communities. “We hope today’s announcement will inspire other financial institutions to follow Liberty Bank’s lead and launch their own initiatives to promote homeownership and address the need to expand fair and non-discriminatory access to credit,” CHFC Executive Director Erin Kemple said.